Did you actually use solder or did you just heat the legs and let it reflow? I am in the process of attempting your fix. Do I need to resolder or simply heat the legs of th IC’s? If I have to resolder, should I apply solder paste? Also, does the resin around the legs melt away with heat? Looking forward to fix this. Sorry for my late reply… I just put some flux on the IC’s legs and heated them until the original solder got fluid again. Most of the blue resin was blown away by this process. So all my dash turns off ..but if I push hard the leftside stick ..Will go on ..but if I let go will go off .. I have a problem with my DIM of S60, the audio alarm doesn’t work. Where is the buzzer/ speaker located in the DIM? It’s the round blue part in the center of the PCB! Is it alright to take that out? Will it screw up anything else if I do? I don’t understand why they put it in there to begin with. I think it will not cause any problems if you take it out. You can try that and just put it in again if it causes problems. I have a problem with my DIM of S60 2003y, fault “SRS airbag sevic. urgent”. Which chip can influence this error? The “SRS Airbag service urgent” error is triggered whenever the airbag module recognizes the airbag warning LED in the instrument cluster is not working. 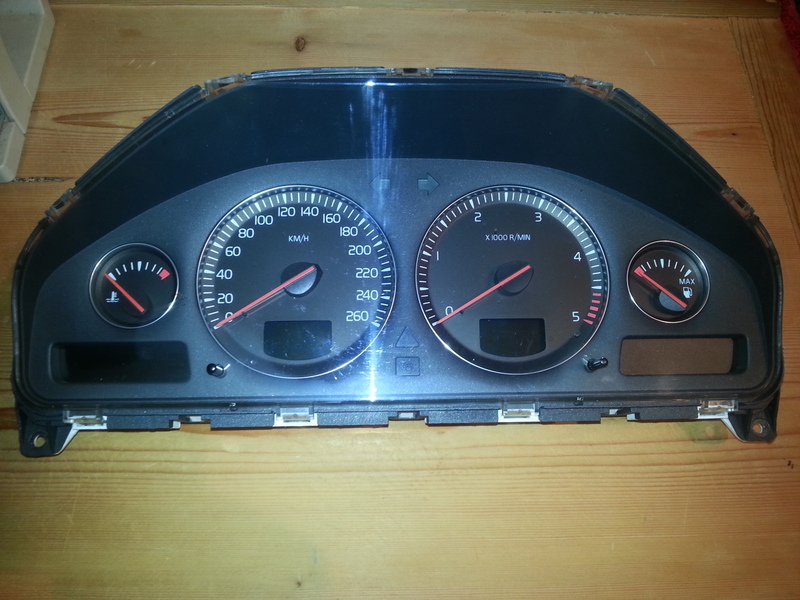 Maybe your instrument cluster (DIM) suffered from a short power glitch because of the problems described in my post. You can reset it using DICE/VIDA programmer or ask your dealer to do it for you. When it appears again your DIM may have some bad solder joints and you have to fix your DIM. As far as I know the SRS-System is working normally even when this error is displayed. But please have your vehicle diagnostics checked anyway because the SRS system is very important for your security! Thank you for the instructions. I have resolderef the board and it is alive now but I have the “SRS Airbag Service Urgent” message constant on the board and not able to reset it. Another problem is I cant open the tailgate door lock with the remote! , my question is do I need to have the error reset at the dealers shop to get this fixed? I don’t think that the tailgate lock issue is related to your dash repair work. Here you can find some additional ideas what to do. Hi my name is tavone and I’m having the same problem with my Volvo 2003 Xc90 my dashboard is out and the SRS airbag service urgent comes on if I press down hard on the left and for a long time my truck said check stop lamp and I never did cause I thought it was the brake light but they was working fine. What should I do? It seems like it’s the same problem on your 2003 Volvo: bad solder joints due to PCB production changing to lead-free soldering. If you have any questions – feel free to ask! Thank you for this extremely helpful technical information! I have a question about the disassembly of the Dim. Although I have tried unsuccessfully. The four meters will not easily pull out. They appear to be being held down by the indicator needles. 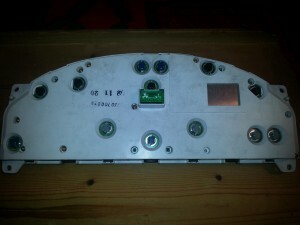 If you have removed all screws on the white backplane, the meters can be pulled out. Maybe they go a bit tight but the screws on the back are the only ones which hold the meters in place. I should have mentioned, my car is a 2003 v70 base model. 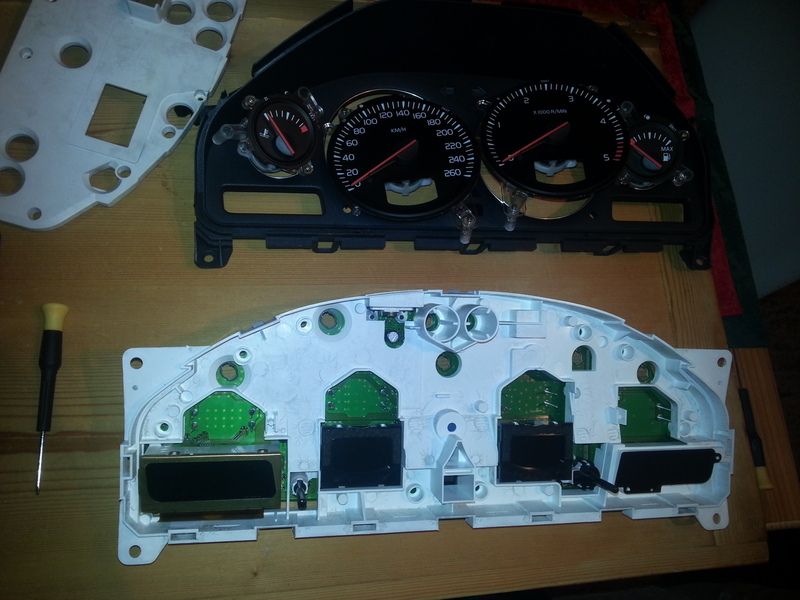 I’m trying to get the instrument cluster on my S60 powered for testing purposes (gauge moment and such). Do you have or know of any CAN message data that does this? Simply supplying the cluster with 12V does nothing, so I’m assuming it is CAN bus related. I’m looking at a cheap Arduino solution, but without the CAN IDs necessary I’m out of luck. It also took me some time to figure that out. You can just carefully pull these bulbs out of their plastic sockets. 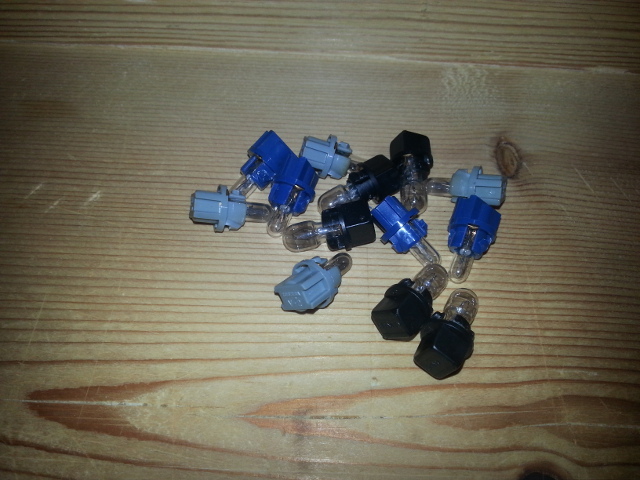 These bulb types are very common and can be found in every car parts shop. Just be sure to reinstall bulbs with same specs. As far as I remeber they have different wattage. Hello. After i resolded, Then all of my three displayes on the panel dissapear. (The trip display, the clock, and the info) but i can see the background light shows on the displays. Do you know which components that makes this problem? Hi, I have a Volvo V70 D5 2002 with I had a professional to resold like you have described. But it is still not working. All the meteres are out of funktion, and you can only se all the displays very faint or smoe times not at all. The indicator for long lights are the only one working. Is there an other part of the board that should bee resolded? I had to try the described resoldering procedure for several times. At first I wasn’t keen enough to heat it up until the solder got fluid. Resoldering the green parts around the motorola chip very carefully may fix your issue. You can also use a regular soldering iron for that if you have one. Good luck! have a XC90- 2003, the SRS light came on and then eventually the dash completely failed. had friend based on your site re-solder DIM… all came back and working except cannot clear the SRS warning, the fault still shows 00D4 lamp indicator fault?? is there a certain chip we need to resolder ? The 00D4 error code is indeed that code which indicates a “connection issue” towards the srs warning LED. That code may come up whenever the DIM looses it’s power for a minimal amount of time. Another possible explanation is that your SRS system really detected a problem with your airbags. If your DIM does not show any visible problems and that error keeps popping up after clearing the errors with VIDA/DICE frequently, please have your dealer check your airbag system. my car dashboard stops working if i park my car outside in a hot day, and guess what i live in dubai!!! Hello. 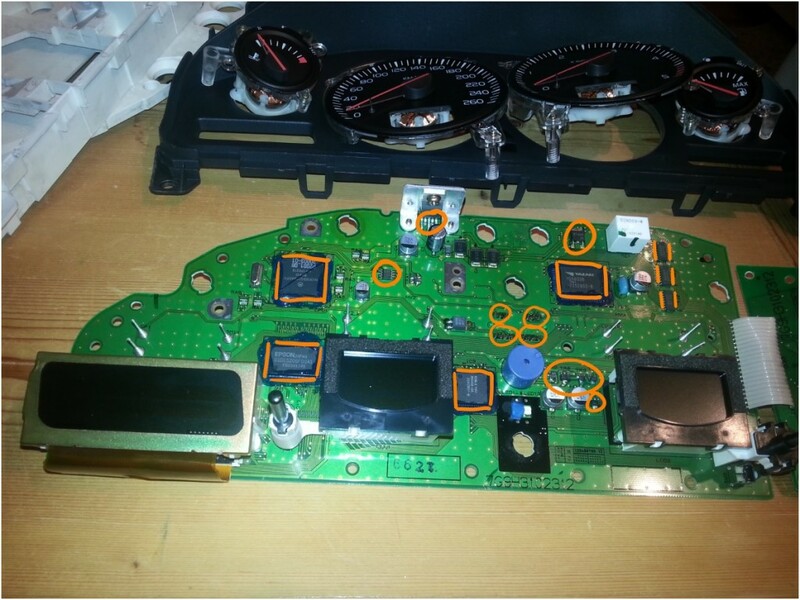 Did you ever have problem only with running clock after repair ? 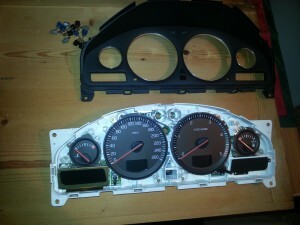 … I repaired a few but one is constantly gave running clock from time to time. I didn’t have that problem. I think the OKI chip is responsible for displaying the time. If there’s any kind of oscillator around that, resolder it. You may also check that button which is used to modify the time setting – maybe there’s a short-circuit responsible for the running clock issue. Good luck! Hi Flo, I am going to give this a shot in a few weeks. I was wondering which brand/make 852D rework station you purchased and the approximate heat and air settings you used to re-flow the solder on your DIM. Also, what air tip diameter did you use? Thanks in advance. I think these rework units on ebay are all the same. I kept the air on minimum and took a medium sized air tip. Temperature was about 290°C for the smaller parts and 320°C for the big ones. Good luck! Thank You for taking the time to document your experience with the Volvo 03 XC90 DIM repair. I have the same vehicle and had the SRS error message for close to year along with the orange triangle trouble indicator. Also the occasional running clock issue. I have been planning on repairing it after reviewing your site for quite some time and had made the purchase of the soldering work station and a scanner to reset the error codes. This last weekend I was forced to take the plunge and make it happen as the whole DIM module had the digital displays scramble and analog meters lock up. I followed your instructions with only paying attention to the indicated components. Bottom line the the repair was rewarding with 100% success after 4-5 attempts to reset the SRS message fault. Thank You once again, you probably saved me over $1,000 dealer cost. Hi Flo ,first sorry for my bad english. I have a problem with info LCD only /just pixels somtimes or darkness/. Is it possible the problem to be in the flat cable. And can be replaced only the cable ,not the display. Thanks ! I knew that a resoldering was the trick, but not were you needed to resolder. Did exactly as you described today and it worked like a charm. I used a soldering station but i think a proper SMD station is the best. hi, can i use a hair dryer for the reflowing? i have a soldering iron but not a hot air gun and im trying to fix my sisters DIM. I have no idea if a hair dryer is hot enough for that – I don’t think so. I also don’t think that you will be precise enough with your resoldering. If you just have a regular soldering iron with a fine tip, start resoldering the easier parts (like the green ones around the motorola chip). Just be careful about accidentially short-circuiting components with solder. For the three big ICs I’d really recommend hot air resoldering equipment. If you have any further questions, feel free to ask! Very useful this info. I am about to this kind of repair for a friend but not as described. After I looked closer to the PCB board from other places, I will suggest to NOT use a heat gun!!! Using a soldering station is not a skill that an average person could do it just after trying on some other board. You are at great risk to irreversible damage the components!!! Instead, all the soldering could be done with a good soldering iron with temperature controlled and with inter-changeable solder tips You will need a sharp pointy tip and one flat tip. It is by very far cheaper than a soldering station. During the soldering process DO use solder rosin on the chips (will explain later) but not much and if the chips terminals get soldered together will not be a problem, we will fix it at the end. First make sure you take the time to solder ALL solder points and add a little bit of solder rosin core on any solder point. Buy before two rolls of solder wick that it is cheap and it will help you to remove any excess of solder. By placing the wick directly on the chips terminals and the solder iron on the wick, the solder excess will be absorbed by the wick and leaving the right amount of new solder on the terminals. You may have to increase a little bit the iron temperature so that the temperature will penetrate through the wick up to the terminals to melt the solder and to be absorbed by the wick. The way I do this, is start on one side of the chip and after setting the wick against the chip terminals and the solder iron on the wick and pull the wick and the solder iron on all terminals from that side. The solder will be absorbed and leaving a clean and nice repaired surface. Do another chip side and let this chip to cool for a minute or two until getting to another side. Do not keep the wick and iron on terminals more than 4-5 sec. If the solder does not melt under the wick, the temperature is not high enough. Normally you will not stay more than two-three seconds in on the same spot. The chances with this method are more accessible to most people, just need to know some soldering techniques and it has less chances to damage even further the PCB board. At the end, inspect at least twice with a magnifier and under a good light that you have no short between any terminals. Make sure you work in a well ventilated area and have not electrostatics (mainly plastic) things or clothes around or on you. Some components on the PCB could get very easily damaged or partially damaged by electrostatic energy. If you do not have the proper antistatic tools, make sure you work on something such as a wood or cardboard surface, not plastic, not glass. During handling the PCB have a wire attached to a ground that makes contact with you all the time (wrap it on a finger or wrist hand). During the removal process from the enclosure have this ground attached to yourself and handle the board only from its sides. The root problem of these boards is way deeper and it is caused by environmental freaks. With the introduction of “lead-free” solder boards, many, many electronics have problems, laptops, tv’s, cars, all. Why? The solder is an alloy of tin and lead. The lead was considered poisonous (like we are tempted to open the electronics and like to lick the PCB boards!!!) thus was removed. The lead role in this alloy was to provide malleability, to not break. In some instances was added a tiny amount of silver (that is malleable but by far not as lead). In short, the companies who produces PCB’s were forced by aforehead mentioned freaks to remove the lead, thus producing PCB with solder joints that are very susceptible to break. That is the main reason that these boards have all these “cold solder joins”. And this is the reason that you must add solder rosin core to each solder point, you will infuse a little lead (the solder rosin still contains lead) that will make the solder point much more durable. I have a 04 v70R. The circuit board is very different. Do you have any knowledge with these? I adapted your directions to my situation. I had to do it twice. Second time I ran around the board with the hot air flowing solder where there was solder to flow. What ya? It worked. Thank you so much for your help. I really do appreciate what you have done here. Hi, some questions in case anyone could answer. The pin 1 is 12 volts, pin 14 is GND but the cluster does will not turn on only with that. Anyone knows if some CAN-BUS message must be sent between pins 2 and 3? Why the DIM when is tested out of the car, after turning on it also is giving a SRS fault Urgent message? Is the DIM storing the SRS lamp fault message or it has a SRS lamp self-test on the DIM even when the test is done without connecting it to the car? Is the SRS error lamp faulted message also stored on the SRS unit or only on the DIM or both? I’m sorry, I did not try to send any CAN messages. The error SRS-00D4 (lamp faulty signal) is not stored in the DIM, it’s stored in the SRS module. These errors are raised when you turn on the ignition without any or with a broken DIM (whenever the SRS module is not able to turn the DIM warning light on). You can reset that error after you successful repaired the DIM using VIDA/DICE or ask your dealer to clear it. Used your technique on 2003 Volvo XC90 2.5 AWD w 191,000 to solve flicker problem with left side text screen (shows avg. mpg, act. mpg, etc.). So far its working great! Hello, if someone would dismantle mileage please tell me TR4 that is second to display on the left. I did send my cluster to Hungry for repair. Now I got it back and I have SRS Service Urgent indicator warning on. I have no ide if this was on before the repair. I bought the car with bad cluster. I have connected the car to VIDA/DICA but there is no fault code. The SRS warning is raised whenever the car does not have connection to the SRS warning light in the DIM. This is a common issue that appears whenever the connection to the DIM is faulty. Just reset the error codes using VIDA/DICE, when your SRS and SRS light works and the DIM connection is ok it should not reappear. Thanks for your excellent description. I just completed the resoldering on a 2002 V70 which had a DIM that went dead after driving a few miles. After sitting a few hours it worked again for a few miles before dying. I followed your description and it now works great. I also used a hot air SMD station which worked great. I have not been able to erease the SRS fault message with my VIDA DICE, but maybe there is another problem with the SRS. VIDA shows both SRS problem communicating with light and high resistance for driver side side impact bag. I had this issue before the DIM died. If the SRS-00D4 keeps reappearing the DIM may still have connectivity issues, it took me several attempts before the resoldering was good enough for the srs warning to keep off. You should have that driver side bag warning checked, because that error does not seem to be related to the DIM problem and can have severe impact on your protection in case of a crash. Hi there,can i ask you,if you have this problem with a dim,can you still drive your car? If the DIM is faulty and does not work from time to time, you can still start and drive the car, although I would not recommend it. Depending on your country’s laws it may even be illegal to do so. I’m not understanding this… I did the resolder, everything worked for a few minutes and now nothing. My electric windows, radio, interior lights, door locks or alarm work any longer. In fact, my blinkers, interior lights also do not work any longer or go on and off. What do you think?? I’m sorry that it did not work for you. Maybe you made a mistake while resoldering. Please re-check your PCB very carefully for shorts. If you cannot find any shorts, try to resolder again. Also check the car’s fuses. My question is, after the dashboard light goes off, my 2004 Volvo XC90 will no move well or like its not selecting gear properly, If I switch off the ignition and allow it rest for some 20mins it will work good again, after driving it for another 15mins the dashboard light goes off and won’t move well again.Does your DIM solution solve that too? Please find someone with VIDA/DICE to read out your car’s error codes properly to track down the issue. Sounds like you have problems with the transmission (too less/old oil or electronics failure). I don’t think that the problems you describe are related to this specific DIM problem in any way. The _only_ way in doing proper diagnostics in this case is connecting VIDA/DICE and reading the error codes. The message after replacing the DIM is “SRS warning urgent”. Any other error messages may be related to the engine itself. Especially if the engine shuts off after a short while instead of going to limp mode there must be something really wrong. Please have you car checked by a volvo dealer or anyone who is capable to read _ALL_ error codes using volvo’s diagnostic tools. Is there a schematic layout available for this PCB ? Would help focussing on particular issues we all encounter. Great info. Have similar issues. Is there also PCB layout / schematics publicly available on the internet ? When your indicator lights work after 20-30 minutes driving it may still be a bad solder joint that has contact after the PCB gets warmer during use. I am an experienced electrician, and working on these small ic chips that close without heat sinks makes me nervous. I only have a problem with the illumination level of the info displays on the mph/km and rpm gauges being very weak and intermittent to illuminating properly. (2004 Volvo XC90). Does anyone happen to know the source of my problem: loose connector location, bad solder joint location? Since my dash is mostly functional I am reluctant to air heat or resolder all the chips you went through. Congratulations to the author and the people who have done this repair successfully. In my book, anyone who could do this repair is rather skilled. believe me people this is NOT hard to do I did it and it works GREAT thanks!!!!! first of all: great repair instructions, thanks for that! You also mentioned that you could reset the SRS error, so I’m guessing you also have a DICE unit and the VIDA software. My question is: Did you ever use it to program your DIM or any other electronics module? I’m just curious because I can barely find any information on how this is done in detail. I know there is a subscription of a Volvo service required and I have to pay for each software-transaction, but that’s all. I’m not sure what you mean with ‘program’ the DIM unit – if you want to load new software in your electronics modules you’ll definietly need a Volvo service subscription. If you just want to change some settings and view/reset error codes of any control unit in your Volvo, just go for one of the ~100€ DICE units which can be found on eBay. My VIDA version was included with the purchase of my DICE unit, but VIDA may also be available as DVD image on some torrent sites. Just keep in mind that you need a WindowsXP machine to run it – I successfully used VMware Player and Virtualbox for that. If you want to use another DIM unit, please save yourself some troubles and talk to a Volvo dealer before doing that. I did not try that and I think it may cause problems if the software versions are different.